The Global Volcanism Program has no activity reports for Mocho-Choshuenco. The Global Volcanism Program has no Weekly Reports available for Mocho-Choshuenco. The Global Volcanism Program has no Bulletin Reports available for Mocho-Choshuenco. 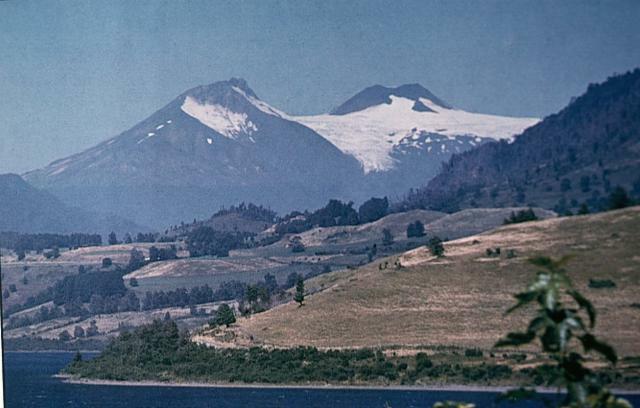 The compound Mocho-Choshuenco volcano is composed of twin glacier-covered stratovolcanoes, located east of Lago Rinihué and SE of Lago Panguipulli and post-dating a 4-km-wide basaltic caldera. The small Choshuenco stratovolcano, constructed on the NW rim of the caldera, is late-glacial in age. A major plinian eruption produced the Neltume Pumice about 10,300 years ago. The larger andesitic-to-dacitic, 2422-m-high El Mocho volcano, constructed within the caldera, is postglacial and has been historically active. Parasitic craters and basaltic scoria cones are located on the flanks of Mocho-Choshuenco, primarily on the NE and SW sides. Two historical eruptions have been reported, one in 1864 and the other in 1937. Lara L E, Clavero J (eds), 2004. Villarrica volcano (39.5° S), Southern Andes, Chile. Servicio Geol Nac Argentina Bol, 61: 1-66. McMillan N J, Harmon R S, Moorbath S, Lopez-Escobar L, Strong D F, 1989. Crustal sources involved in continental arc magmatism: a case study of volcan Mocho-Choshuenco, southern Chile. Geology, 17: 1152-1156. There is no Deformation History data available for Mocho-Choshuenco. There is no Emissions History data available for Mocho-Choshuenco. The compound Mocho-Choshuenco volcano, seen here from the SW, is composed of two glacier-covered stratovolcanoes post-dating a 4-km-wide caldera. Choshuenco (left), was constructed during the late Pleistocene on the NW rim of the caldera. The andesitic-to-dacitic, 2422-m-high El Mocho (center), is a small cone that grew within the caldera and has remained active into historical time. There are no samples for Mocho-Choshuenco in the Smithsonian's NMNH Department of Mineral Sciences Rock and Ore collection. IRIS seismic stations/networks Incorporated Research Institutions for Seismology (IRIS) Data Services map showing the location of seismic stations from all available networks (permanent or temporary) within a radius of 0.18° (about 20 km at mid-latitudes) from the given location of Mocho-Choshuenco. Users can customize a variety of filters and options in the left panel. Note that if there are no stations are known the map will default to show the entire world with a "No data matched request" error notice. Large Eruptions of Mocho-Choshuenco Information about large Quaternary eruptions (VEI >= 4) is cataloged in the Large Magnitude Explosive Volcanic Eruptions (LaMEVE) database of the Volcano Global Risk Identification and Analysis Project (VOGRIPA).